The dynamic optimization of ImageEngine can yield up to 84% payload improvement, much more than the typical 3 image approach of responsive images. Simple, right? The steps are clear enough, but Google makes it sound easy and painless. The reality is that a simple website with a small number of images might be able to follow this responsive image process. But implementing this workflow on a site with thousands of images while maintaining quality is challenging and potentially very labor intensive. Google pointed out that these steps should be systematized and automated. However, the process they describe (in step 2 at web.dev/fast) involves stringing together disparate tools and writing lots of additional code. For example, without responsive images, you have 1 image and 1 simple img tag of code. Adopting the responsive image approach generates approximately 9 image variants and over 20 lines of code with complicated breakpoint calculations. Where before you could add an image in seconds, now you are looking at a much longer multi-step coding process. And given the fast pace of change in mobile devices, image formats, and resolution, there are bound to be problems. It is a great approach in theory, but one that a human should not do. Automation is essential. Instead of reinventing the wheel, there is an automated tool already available. ScientiaMobile ImageEngine takes the original image, instantly recognizes each distinct browser and device model requesting an image, instantly compresses the image into the right format, and delivers it via a global CDN. Even better, the results are greater than with traditional responsive images. 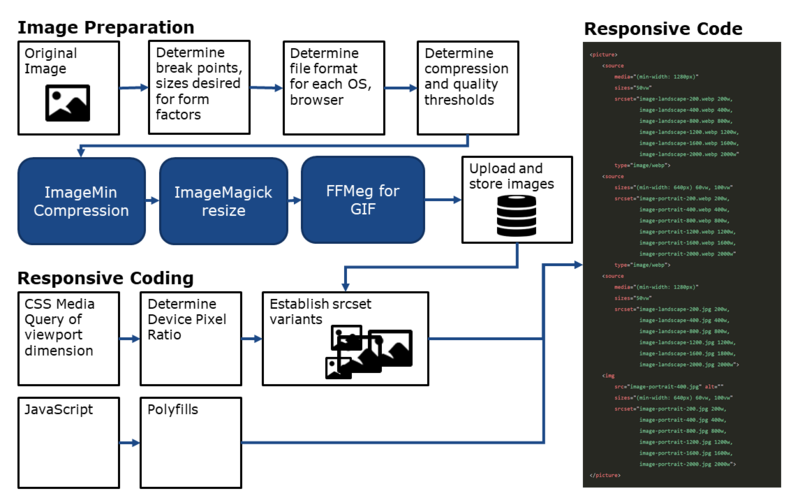 Our analysis shows that the dynamic optimization of ImageEngine can yield up to 84% payload improvement, much more than the typical three-image approach of responsive images. While there is still a solid reason you might use responsive images for art direction, ImageEngine can handle all the responsive resizing and shrink over 20 lines of picture markup down to a single line. Retrofitting your existing img tags and leveraging Client Hints will streamline your code and accelerate your web page. ImageEngine cuts out all of the work. No guesswork about breakpoints, no endless resizing processes, no debates about image quality. GIF to MP4 or WebP. Done automatically. No re-coding required. JPG or PNG to WebP. Done automatically. Compression while optimized for quality. Done automatically. Display size and density. Done automatically. Faster and more accurate because of ImageEngine’s server-side detection. Works with client hints. JPG or PNG to JPEG 2000 – Done automatically. Better for Apple devices and Safari. CNAME for easy deployment in Magento, Shopify, WordPress, Drupal, SiteCore, Sitefinity, and Kentico. In the end, the fact stands that images make up over 60% of website payload. Anything you can do to minimize that payload will improve web performance. However, developers need to think strategically about how to achieve those performance gains. They should also think longer term about maintaining the site. New devices, browsers, screen sizes, display densities, and file formats will arise. The approach that Google proposes will work for Chrome images today, but it will not deliver great performance for Safari on Apple devices. In the end, an enterprise with thousands of images is better off looking to an image CDN to handle the complexity and ensure fast delivery.